For people not familiar with street photography, it is an art form combining photography, ethnography, sociology, and a test of split-second reaction. Icons of photography such as William Klein, Henri Cartier Bresson, and Gordon Parks have given us a peek on the nuance of what it is to be human: love and suffering, happiness and bouts of sadness, working and relaxing, or the simple daily motions of going about your day. A street photographer's camera is similar to a jeweler's loupe, as the photographer holds up the camera in front his eye he should be able to capture the cuts and facets of the people and environment that surrounds him. A step forward or a turn of the head will give the photographer entirely different view like the jeweler rolling a piece of precious stone between his fingers in front a lamp. An aspiring photographer in the 21st century might find street photography a mundane category of photography. Fashion and social media have become an evermore crucial aspect of our lives making us look like a hospital patients holding onto a pole as the IV bag slowly feeds us the latest influencer or clothing brand releasing its new batch of printed tees. 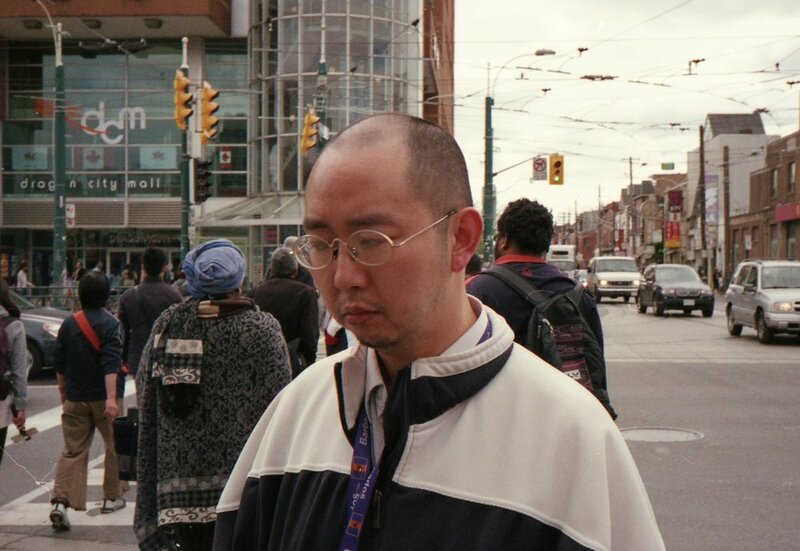 With photographers desperately trying to be part of the mainstream culture with hashtags and generic shooting style, it was nice to discover Sally Han, a photographer walking around Toronto's Chinatown and capturing scenes of people and culture. Chinatown brings new sights, sounds, and most definitely smells against the backdrop of the western cities. You see fruits that bore from a martian planets, signage with Asian characters and letters with poor translation besides it, and cabbages and vegetables being sold in a cardboard box the size of a bathtub. These are familiar scenes for Sally and her camera so I asked her why she visits Toronto's Chinatown and more about what got her into street photography. What got you into photography? and more specifically, what got you into shooting street photography? I remember the first moments of being aware of and being captivated by photography were in high school when street fashion photography and blogs/Tumblrs were in the pique of its exposure in the mainstream. At that time I was extremely excited by this certain democratization and accessibility of fashion that was happening through its presentation as serendipitous encounters in the streets with people with articulate personal style and not as some gated elitist institution. Early influences were photographers such as Scott Schuman, Tommy Ton, Guerrisms, Noah Emrich, Hyunbum Nam, and so many more. It may sound crass to some to cite these people as influences since photography popularized by and populated on street fashion blogs (a lot of the times indiscriminately so) is slow to be enfolded and legitimized into the photography canon. But that exposure is what really got me excited initially about street photography. As to the specific circumstances of turning that interest into practice was when I was packing to go to Korea a couple summers ago. I suddenly had a pressing feeling that I needed to lug my parents’ old bulky film camera that hadn’t been used for like 15 years. I think it was a sense of needing to document this monumental trip in some tangible way. At the end of the summer when I came back to Korea, I bought my own film camera and started shooting. At the start of school that fall I met my now good friend, Jules, who coincidentally is an incredible film photographer and between classes we would walk around and shoot. Are there particular spots you typically go to when shooting? Or do you like to travel for your shoots? In Toronto, I usually gravitate towards Chinatown when I’m shooting, primarily because it’s probably the most densely concentrated area with pedestrians at any given time. I don’t think I have a desire to travel elsewhere specifically just to shoot. For me, taking photos is a time to meditate on my identity in the Canadian cultural context so leaving this milieu just to shoot would lend the whole process to exotification of a place that I don’t culturally understand or have time to fully engage with yet. Is there anything particular you look for when shooting? Maybe about a place, or a person, or some 'pattern' you try to see? In the moment, not really—it’s more just impulse and what intuitively looks interesting to me. But when I look back at the totality of my photos, I see that I am drawn to people who seem to articulate a sense of self in a unique way with what they’re wearing or how they carry themselves. Also if I sense a tension or interesting dynamic in interactions between two people. Who are the photographers you enjoy? Are there any non-photography artists you enjoy and constantly go back to? Some of my favourite photographers are Teju Cole, Andre Wagner, Shin Noguchi, and Martin Parr. My friend also recently introduced me to Zhang Xiao who has a very surreal style that I love. In terms of other non-photography influences, I have always been a big fan of Japanese magazines such as Popeye, The New Order, Brutus, Ollie, and the like. I’m also constantly inspired by Teju Cole’s writing—he articulates very specific feelings about the sociopolitical contexts of his photographs in such a lucid and succinct manner. 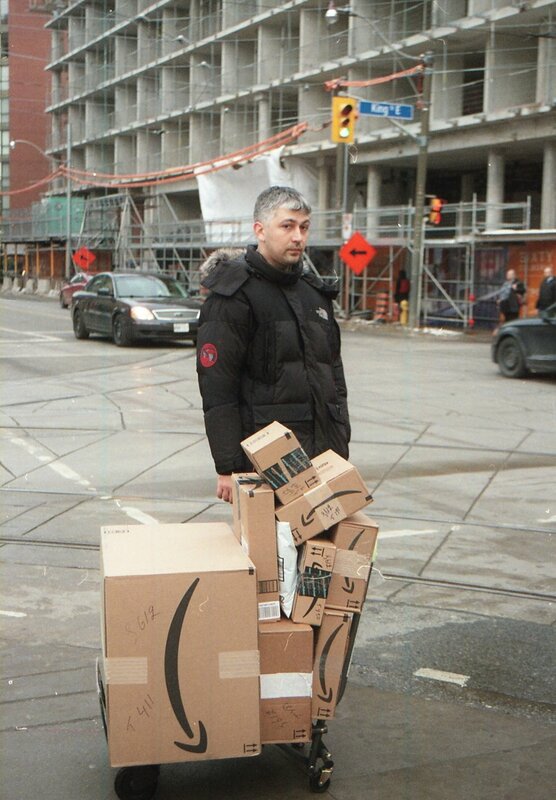 He has an amazing column in The New Yorker called On Photography that I constantly go back to and only hope someday to be able to communicate my understanding of my Canadian identity with the same mastery that he does. What are your favorite food spots in Toronto? I don’t really have a favourite per se in terms of restaurants as a whole but there are some dishes that certain restaurants do well that I go back for. I love Maker Pizza, which is in Chinatown, and their Porky is the best pizza I’ve ever had. Rol San’s for dim sum and the bakery next to it (Ding Dong Pastry) has the best egg tarts in all of the countless bakeries in Chinatown, in my humble opinion. One of my favourite Korean dishes is soondae-guk and this restaurant called Sariwon is the only place I’ve been to that makes it to my liking, with lots of pungent perilla leaves. I am not really into ramen but the spicy miso ramen at Santouka is very good. And I know it’s obviously not local to Toronto but in all honesty, my ultimate favourite is the poutine and hot dogs at the food court in Costco. Sometimes I go through the exit door without a membership card just to eat in there—I am just that subversive. Any other spots you love going? This may sound weird but I really like sitting in the back patio of Casa Loma and looking at the finely groomed shrubbery while eating a hot dog (although I can’t do this often because of the admission price). Right now I am using an Olympus 35 SP rangefinder, Yashica T5 and, more recently, a Nikon FM. What are you doing when you are not photographing? School and work and thinking about when I can go outside again to shoot. Are there any lessons you've learned while photographing? This isn’t so much a lesson learned but it’s something I’m always reflecting on and being mindful of: to always be critical about what kind of narrative I’m imposing on subjects and to be aware of the power dynamic established inherently by being the one in control of the photographic production. Anything that is chronicled through photography has the risk of being presented to viewers as an opaque, indisputable social truth. 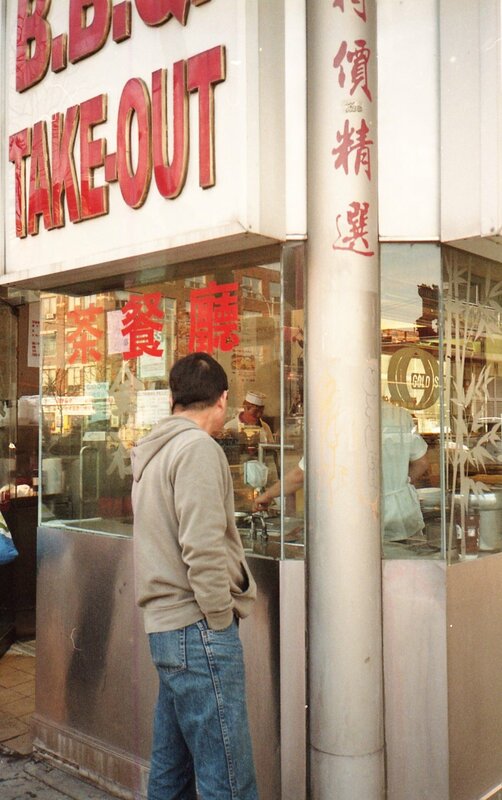 With the popularization of street photography these days, I see a lot of white male photographers shooting in Chinatowns and fetishizing the “Oriental Aesthetic” and aestheticizing Asian immigrant labour. 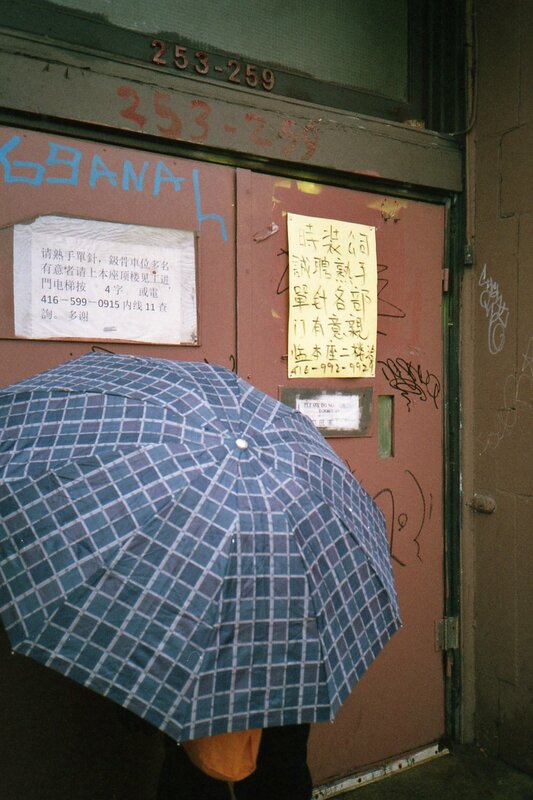 As an Asian shooting in Chinatown, I try to be critical of my photos and ask myself if the way I captured certain subjects is an expression of my internalization of these racist and classist narratives. I think the main lesson I am pushing myself to learn through photography is how to unlearn these narratives and capture my authentic relationship to Canada.